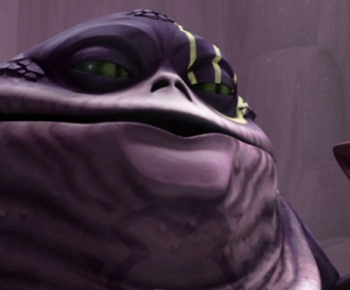 For me, this three-episode-arc, which hinges on the Hutt family’s successful schemes to break Ziro out of prison, on the whole is lesser than the sum of its parts. Each of the three chapters taken on its own has its merits–particularly the first two–but this is the first multi-part story that for me never managed to fully justify its existence, or rather, it ended up seeming a bit anti-climactic for a plot that took three episodes to unfold and had been continuing a thread first introduced in the film and which had been brought up again earlier this season. Again, however, putting aside the connective tissue linking these chapters together, they’re each entertaining and–in the case of the first two–solid episodes. 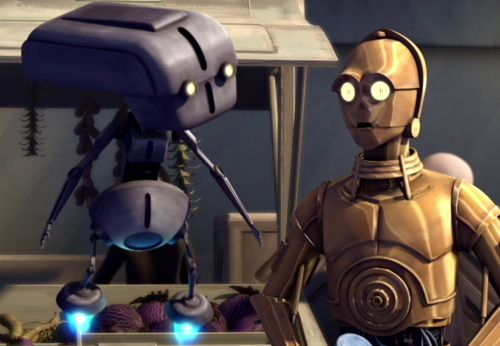 It’s been a long time since we’ve seen interaction between Threepio and Artoo on Clone Wars, and for anyone who loves their relationship from the original trilogy, “Evil Plans” (episode 3.08) is a real delight, being the first episode to actually center on their friendship. Cad Bane’s reasons for wanting to capture Threepio specifically might possibly seem a bit forced. He needs to steal the Senate building’s plans in order to stage the hostage scenario that plays out in the next episode, yet it seems that there could be far better options for other droids that might have these blueprints, rather than focusing his entire plan on kidnapping Padme’s protocol droid (as opposed to the Artoo two-parter in Season 1, in which it made sense that Artoo was captured, since he was Anakin’s droid and it’s likely that Palpatine knew that Anakin didn’t flush his memory–Bane is not, however, working for Palpatine here). Also, it seems that this episode was created with the main purpose of being a prequel to the first season finale, which fits immediately after it in series chronology, in order to explain how Bane got the plans, and the resulting episode doesn’t really explain why the writers felt that a necessary piece of information to impart. But putting aside suspension of disbelief issues, Cad Bane’s motives are really a McGuffin for giving us a fun little adventure for Threepio and Artoo, in which Threepio behaves so very Threepioishly–speaking of which, I never knew how badly I had needed to see what Threepio would be like as a party planner in my life until now–and Artoo has to unsurprisingly come to the rescue. It has always been one of the subtexts of the Threepio/Artoo relationship that, although the former is the one who looks more like us, can speak our language–and does so at length–and fancies himself a highly intelligent being, tiny Artoo, he of the garbage-can-shaped body and swiveling head and who communicates through beeps, is actually the real brains of the operation and hero of the two, and this episode really underlines that. Although much larger, Threepio is, for all intents and purposes, defenseless when the bad guys come to grab him, and accidentally outs Artoo as a better target during his interrogation. Artoo, on the other hand, easily eludes capture and fights off the villains until realizing that they’re going to harm his friend, at which point he bravely allows himself to be discovered in order to spare Threepio more pain. I also love how the show doesn’t ignore the nuance that just because Artoo is the smarter of the two doesn’t mean that he doesn’t have a mischievous side as well, one which Threepio has a tendency to bring out in him. While they are good friends and, in Threepio’s words from the original trilogy, counterparts, Threepio could drive anyone up a wall, including Artoo, and at times, such as here and later on when they have an argument on Tattooine in Episode IV, they have a bit of a spat and Artoo goes off on his own, perhaps not the wisest course of action, since in this case, Threepio is right–they are supposed to return immediately to deliver the fruit that Padme needs for the party. But Artoo can’t help ignoring him and going off to the droid spa, and really, who could blame him? The desire to annoy Threepio must be overwhelming at times. Despite this, however, when he realizes that his friend is in danger, the ever-loyal Artoo returns to his side, and even though he fails to protect him, it says a great deal about him that he volunteers himself for the situation, with no exit strategy. And significantly, at the end of the episode, Threepio and Artoo’s memories of the traumatic event are wiped, foreshadowing their later memory wipe between the events of the prequel and original trilogies.